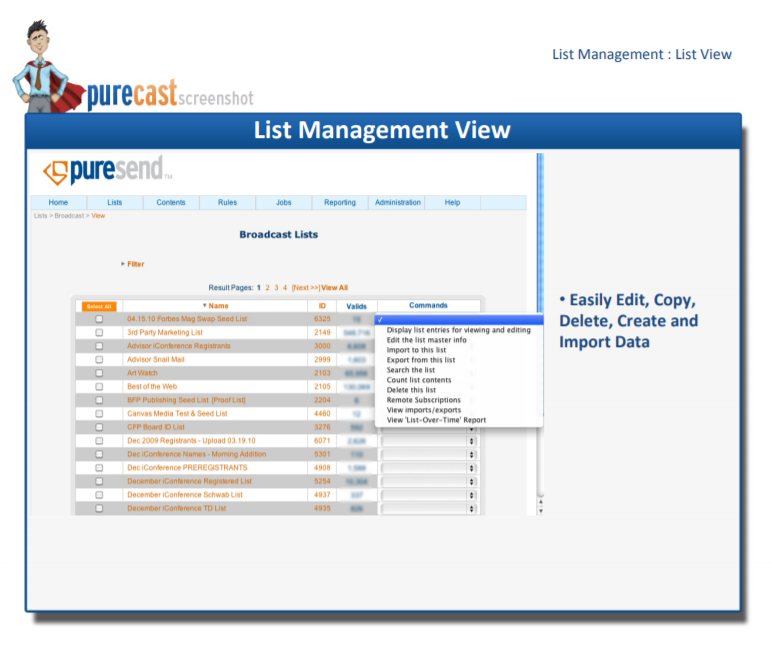 Purecast is a complete web-based email management solution. It's easy to use and it is accessed securely by customers from any web browser. Our complete feature sets and superior value work together to attract a broad range of users from Small and Medium-sized businesses to Large Enterprises, Marketing Agencies of all types, and Performance-Based E-mail Marketers. Pros: Intuitive Work Flow: Having started using the product after it had already been implemented I was expected to become familiar with it as soon as possible. Thankfully the system was set-up in such a manner that learning how to navigate it was quite easy and never confusing. Support Staff: I use this product every single day and as a result I occasionally run into a problem, or have idea for a feature that I would like to see included. The support staff is always immediately available and willing to work with me. Generally my problems are addressed very quickly, unless it requires new feature development. Cons: As with any email system, it can be hard to keep abreast of all of the changes on the ISP level that affect our deliverability but puresend has worked with us on this. Overall: I would absolutely recommend this product to anyone. I am a daily user of the product and have found it meets all of my needs. The support staff is friendly and always available, and the product itself is very easy to use and I have been able to train others on it with no issue. The product, above all else, is consistent, which is an absolutle necessity. I cannot work every day on it and worry if something will function properly or not. I do not have that problem and I am thankful for this. Pros: Purecast is very straightforward and extremely easy to use. The level of support you'll receive, for any questions or assistance, is beyond top-notch. Puresend isn't like your typical email provider where you submit a question/ticket and have to wait for days for a response. They become partners with their users. Your success is their #1 priority! Cons: There isn't a single thing I could say bad about Purecast. I've been a happy customer for a while now! Pros: Intuitive work flow, easy to reach support staff, continuously evolving and they'll work with us to customize solutions to meet any needs that arise. Overall we are very happy. Cons: It is structured a bit differently than other email solutions we've used in the past so it took us a little while at first to figure out how to use it but now that we know it, we vastly prefer it. So it was worth the training time invested. Puresend also really held our hands during our ramp us phase and practically worked on site with us until we were comfortable. Pros: Compared to other email providers, Puresend is top of the list when it comes to being user friendly. If there is anything that I need their customer support is quick to accomodate those needs. The reporting system is tremendous. Cons: As of right now there is nothing negative to say about my services with Puresend. Overall: I would Highly recommend Puresend. Pros: Does everything you'd want for a competitive price. Cons: The interface is very basic and often not terribly intuitive. Overall: Strongly recommend. Good for power users and those who don't require a lot of hand holding or explanatory interface.